The Parish Council are please to announce that there are now two defibrillators in the Parishes – with a third not far behind. 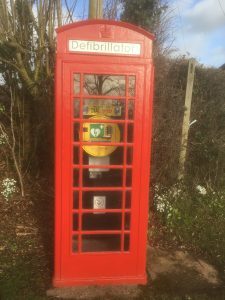 The Council has now funded defibrillators at Bosbury Parish Hall and Catley Telephone Booth. A defibrillator is in the pipeline at Coddington too. The Parish Council also recently organised a Heart Start training evening for parishioners. This was very well attended. A defibrillator awareness evening has been planned for the 28th March 2019 in Bosbury Parish Hall at 7.30pm. This will be led by The HeartBeat Trust. Please click this link for details.